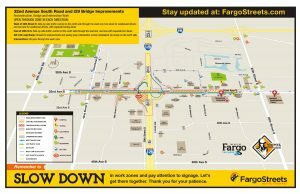 FARGO, N.D. (June 8, 2017) – By end of day Friday, June 9, drivers will see two updates to traffic control surrounding the I-29 bridge and access the interstate traffic in place. Drivers should expect short delays, stay alert, and pay attention as crews make these changes to traffic control throughout Friday. 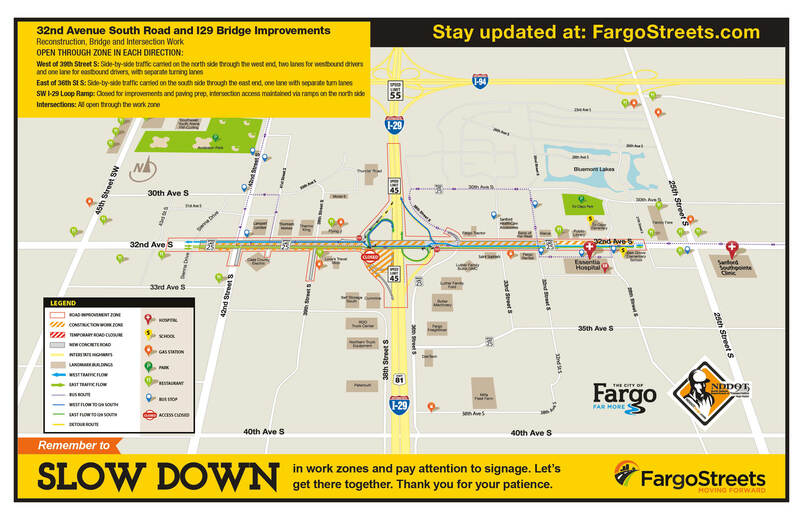 The southeast loop ramp will reopen for eastbound 32nd Avenue South traffic in order to go northbound on I-29. Crews have widened this existing ramp to allow for quicker interstate access and to accommodate the added lane of traffic on 32nd Ave S. Eastbound Traffic will no longer use the northeast ramp for access to northbound I-29 traffic. The next shift for traffic will happen when motorists can start driving on the new north side pavement on the east side of 32nd Avenue and work will begin to remove the south side roadway and underground utilities on the east portion of the project. This is slated for later this month, weather permitting. On Tuesday, June 13, the next public meeting will be held from 10:00 a.m. to 10:30 a.m. at the Dr. James Carlson Fargo Public Library (2801 32nd Ave. S, Fargo) Community Room. Attendees will be able to walk through project maps and hear more about the construction progression with city and state engineers. As a reminder, the speed limit on 32nd Ave. is reduced to 25 mph and 45 mph on I-29. Please slow down and pay attention to signage.